The primary fermentor, available in 20, 30 and 55 gallons sizes, contains a false bottom that separates the pomace from the wine as the free run is drained from the fermentor. The grapes can then be pressed with a vacuum pump and sliding piston (sold separately). Using this method, there is no need to move the pomace to another vessel for pressing, and the wine is pressed off the pomace in a sealed environment, minimizing oxidation and possibility of contamination. Pressing is also highly efficient, and cleanup is much easier than on traditional bladder or ratchet presses. It is also done in a manner that does not extract harsh tannins from cracked seeds or stems. 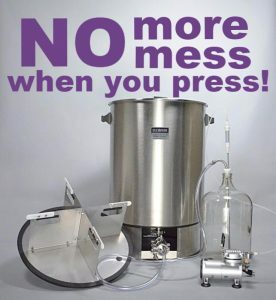 And since the vessel is used for primary alcoholic fermentation, pressing, and bulk ageing, you’ll save money too! Call us at 604-473-9463 or Email us at brew.bosagrape@gmail.com for pricing!